Available in silver or gold stickers. The shengshou mirror cube is great, with a VERY smooth feel. It is very fast and overall a pleasure to solve, which I do a lot. It is very cheap too, at around 4-5 dollars. I recommend this cube to any puzzle collector or speed solver or even a beginner because you solve it exactly like a 3x3. This cube really surprised me out of the box. I thought it wouldn't be that great but it turned so smooth. I had expected it to turn roughly and almost feel like a rubiks brand, but not at all. Locking does happen a lot because the cubbies are different shapes. Corner twisting is pretty much impossible. Minimal corner cutting. I also like how it's tensionable. This cube is very fun to solve and very easy. It's also really fun to baffle friends and family when you solve it. This cube is definitely worth it. Fun cube to solve, every now and then, it turns pretty well. The cube is pretty tight and you can't evenly loosen it because some of the sides are so close to core, the screw has no room to be loosened. Basically if you were to loosen it, the centre cap would not be able to fit over the screw head. 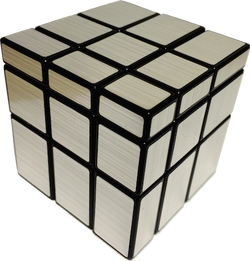 The ShengShou mirror cube is an interesting puzzle. Mirror cubes are generally solved just for fun, and not for speed, so keep that in mind while reading this review. Out of the box, the cube looks really awesome with all the reflective stickers. It's a little tough to turn at first, but after adding some lube it got a bit better. It was actually really fun to solve even though it's basically a 3x3. There was pretty much no corner cutting, and it popped a couple of times on me. In conclusion, it may not be a great cube, but for the price (this is something that seems to apply to a lot of ShengShou puzzles), it's really fun and definitely worth a look. This is a 3x3 Shapemod by Shengshou, and instead of solving by color, you have to determine by shape. The cube is fast but as the pieces reach so much into the core, corner cutting is little (but you dont need it), but the puzzle does not lock up much. This cube is a ton of fun. It turns buttery smooth without any clicking or catching. It can be difficult to turn because of the shape modding, but the tension can be loosened to help with corner cutting. I have felt other mirror blocks and it seems that the only one out there to get is the Shengshou version.